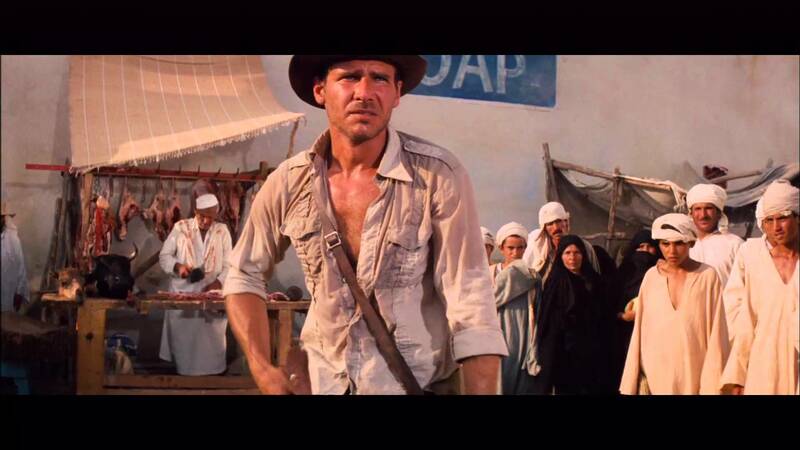 There is a scene in Raiders of the Lost Ark where Indiana Jones runs into a bazaar in pursuit of the Nazis who have kidnapped his ‘girlfriend’. Looking this way and that, he jumps up onto a cart full of straw to get a better view, but there is no sign of them and with a heavy sigh, frustrated and hot, he jumps back down. At that moment the crowd parts to reveal a six foot five sword-wielding assassin, dressed from head to foot in black. Smiling manically, the assassin twirls his scimitar from one hand to the other, inviting Indy to take him on. Tired beyond measure, covered in sweat, breathing hard, the American, with only the tiniest of shrugs, points his gun and shoots the assassin in the head. Indy’s a pragmatist. It’s not that he is without honour or belief, it’s just that in the day-to-day experience of his life (jumping out of burning buildings, being dragged behind tanks, fighting Nazis) and in the pursuit of his goals (collecting, saving, and protecting unique archaeological artefacts), he generally takes the most pragmatic option – the quickest, most efficient, and effective way to get the job done. Yet, although his actions are driven by pragmatism (rather than ideology), Indy is not without morals; he has a passion to protect the past, a commitment to the preservation of historical artefacts, a hatred of Nazis, a willingness to take risks, and a readiness to do what’s necessary. These values, among others, shape his relationship to family, friends, institutions, and rivals; they motivate him, they drive him to act, and they justify his actions. So, when Indy acts, he acts pragmatically, but always within a framework of ideas, beliefs, and values that represent his standpoint in the world. In my last blog, I argued most teachers are, by disposition, neither traditionalists nor progressives, but generally work somewhere in-between. By this I meant they don’t adhere entirely to one philosophy or the other (taking ideas from both) and are quite prepared to use strategies from either, as and when they think it appropriate. This I called ‘pragmatism’. This is fine up until a point, but it doesn’t really capture the whole picture. Like Indy, Teachers, although pragmatic, do not operate in a moral vacuum and their beliefs, ideals, and values affect how they act in the world. When they make a choice of strategy in the classroom, their moral compass affects that choice, just as Indy’s moral compass (however different) affects his choice to shoot the assassin. What I’m getting at here is that all of us operate within a moral framework and this framework is what guides us when we make choices about the kinds of ways we operate in the classroom. They are not ideological, in the sense of being researched, formulated, and applied, but are rather the kinds of moral choices we make in our wider lives, formed through family, community, and experience. So, when faced with a new strategy, a teacher will test and evaluate that strategy, based on their moral framework. If it fits, they will try to incorporate it; if it doesn’t, they won’t. This is why teachers can use strategies from both ends of the traditionalist-progressive spectrum without fear of contradiction. Since, although they might conflict with these philosophies ideologically, they don’t contradict the deeper, underlying, moral framework that the teacher operates from. Thus, you see teachers using direct instruction in one lesson and then switching to inquiry in the next. What matters is not whether the strategies comply with the diktats of one side of the ideological divide or the other, so much as, whether they are the best method to teach that part of the curriculum at that time. For these teachers there is no contradiction in using both DI and inquiry, they are just tools in the toolkit, what matters is finding the best way for students to learn – that is the teacher’s moral purpose for being in the classroom. In fact, I would argue, very few teachers are genuinely ideological in the sense of planning and applying their classroom practice based on heartfelt ideological tenets. The ones that do are outliers; people operating on the margins of the bell-curve. They’re the ones who might be called traditionalists and progressives, because they genuinely believe and act on these philosophies. But for the others (I’m suggesting the vast majority) they don’t work from ideology, they work from a sense of pragmatic idealism. These are the Indiana Joneses of the classroom, people using and applying whatever they find to get the job done (without the whip, sorry). Footnote 1: The actual scene between Indy and the swordsman was meant to involve a lengthy battle between whip and sword. However, (apparently) Harrison Ford had eaten something disagreeable the night before and spent most of the day running between the set and the toilet in his trailer. Consequently there wasn’t time to film it properly and the alternative (much shorter and funnier) scene was used in the final film. You can read the whole story here and see the deleted scene. Footnote 2: My argument concerning moral frameworks draws heavily on ‘The Righteous Mind‘ by Jonathan Haidt. If you haven’t read it, try to find time over the summer. It is excellent.